There is a hidden feature that few iOS users know about. Have you ever felt like your fingerprint is not being recognized when you are in a hurry to unlock your phone? Or perhaps your fingerprint is not unlocking your phone the way it was meant to? This is because whenever you train a new finger on your Touch ID sensor, you only have a few tries before the operation is complete. However, many parts of your finger has not been recorded. To train the phone to recognize more parts of your finger without having to add the same finger a second time, it’s actually very easy. The idea is to improve readability of your finger, not to replace it. In my opinion, recording the same finger twice could help, but it could also “confuse” your phone, making it take a little longer for the recognition process to take place. 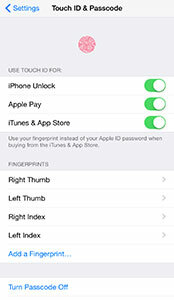 Open settings and go to “Touch ID & passcode”. 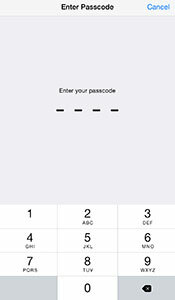 After entering your passcode, you will see the main menu for your passcode and Touch ID. 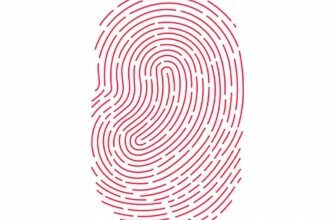 Without doing anything else, simply place any of your pre-registered fingers on the Touch ID as if you were unlocking the phone. In the list of registered fingers, notice how the label for that particular finger is highlighted in gray. In the example below, I used the “left thumb” when I took the picture. The idea here is to touch the sensor as many times as you like, in order to register or re-train more parts of your finger. I always like to start from the center and going outwards. Every time you see the label highlighted, it means that the are of your finger touching the sensor was recognized as being for that finger and it is therefore getting registered. You will soon realize that most of your finger is being recognized. At one point, every time you change the position of the finger touching the sensor will be highlighted. This means that your entire finger had been fully registered and stored. 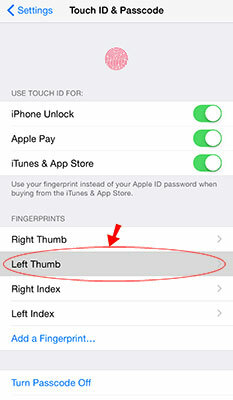 I hope this steps can help you improve the readability and accuracy of your Touch ID sensor. Let me know if you have any other question on the comments below.